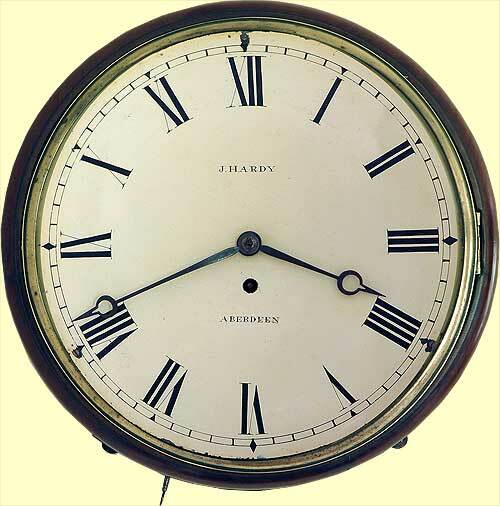 Wall Dial Clock by John Hardy of Aberdeen. | Antique Clock Sales. John Hardy of Aberdeen Dial Clock. Mahogany case with bottom and side openings. Wall fixing brackets to corners. Dial signed 'J Hardy Aberdeen'. John Hardy, Clock and Watchmaker of 17 Huxter Row, Aberdeen. Succeeded John Gartly an emminient maker of clocks, watches and turret clocks at 7 Huxter Row, Aberdeen. John Hardys known working dates 1827-39. Died in 1839 and his widow continued the business until their son William Hardy took over in 1853. 27 West North Street in 1855. Died 31 January 1860, aged 32.